software is installed you can create a database (or databases) with the SQL Server software that is then managed by that SQL Server software. Many people refer to SQL Server as a database, which it is, sort of. SQL Server is actually an application, a Relational Database Management System (RDBMS), which can contain multiple databases. 1. Expand the SQL Server Group item, if it isn’t already expanded, in the Enterprise Manager tree. Once expanded you should see a list of SQL Servers that are registered with Enterprise Manager. 2. 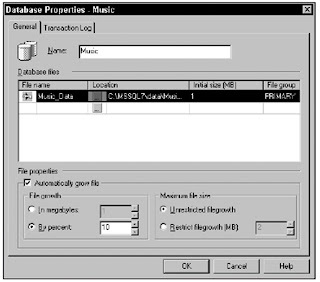 Right-click the SQL Server in which you want to create the Music database. 4. You see the Database Properties dialog box, shown in Figure 4-1. On the General tab, enter Music in the Name field. The Database Properties dialog box allows you to control other features of your database such as file growth, maximum database size, transaction log files, and so on. For the sake of brevity, accept the defaults.